A new piece of Cree artwork has found a prominent place of display in the City of Saskatoon. 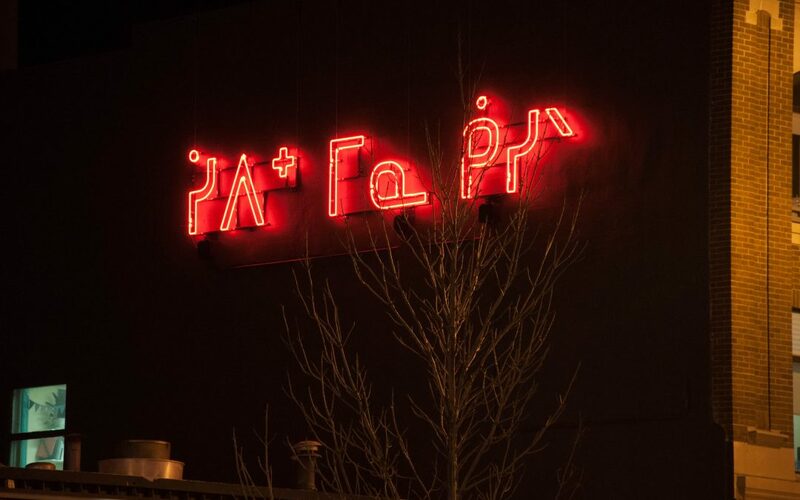 The artwork was developed in collaboration with several Cree artists and is a giant urban light sculpture, which reads the words “River and Sky” as they would appear in Cree syllabics. The artwork is displayed on the Saskatchewan Craft Council building and creates a vibrant sight when on the city’s Broadway Avenue at night. The artists say the intention of the artwork was to create a poetic representation of Treaty 6. “The artwork connects to the treaty relationship referencing the term ‘as long as the river flows, the grass grows, and the sun shines,” said collaborator and Cree artist Joseph Naytowhow. Naytowhow collaborated on the project with fellow Cree artist Kenneth T. Williams and lead artist Tony Stallard. Stallard has crafted similar pieces and he says “River and Sky” is a sister work of “Land of Berries”, currently on display on the Persephone Theatre. While many of the cultural leaders and dignitaries gathered spoke on the challenging work ahead for Canadians in terms of reconciliation, some pointed to this artwork as an example of how Saskatoon is leading the way. 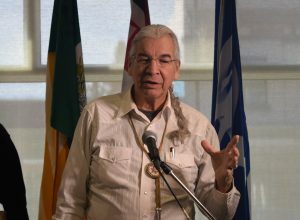 Culbertson’s sentiments were echoed by Saskatoon Mayor Charlie Clark. The art display is scheduled for the prominent spot for the next three years, but there is a possibility it could become a permanent fixture in the city’s skyline.